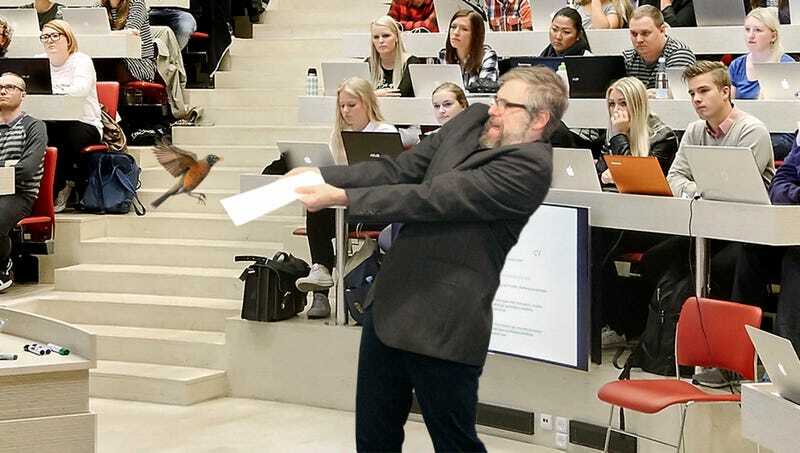 KALAMAZOO, MI—Failing to complete the simple task despite his ostensibly robust academic background, onlooking students at Kalamazoo College reported Wednesday that their supposedly educated literature professor Gene Cabella demonstrated no clue as to how to rid their lecture hall of a bird that had flown in through an open window. “He was talking a pretty big game about his intensive syllabus, then the bird came in and he completely panicked. Guess you didn’t get your PhD in birds, huh, Professor?” said sophomore Ken Pei, chuckling to himself as he sat back and watched his so-called academic superior frantically wave a manilla folder in the general direction of the bird, jump backwards when it flapped its wings in his direction, then spend the next few minutes attempting to ignore the creature’s loud chirps as if the entire class hadn’t just watched him desperately try to scare it away. “You’re the one in charge here, bucko. Sorry they didn’t teach you this at Yale—do they not have birds there? Well, guess what, you’re at Kalamazoo now, fucker, so you’re gonna have to learn to deal.” At press time, Professor Cabella’s credibility had reportedly taken an “absolute nosedive” after he paused the lecture once more to place a panicky, stuttering phone call to the campus maintenance department asking for assistance.